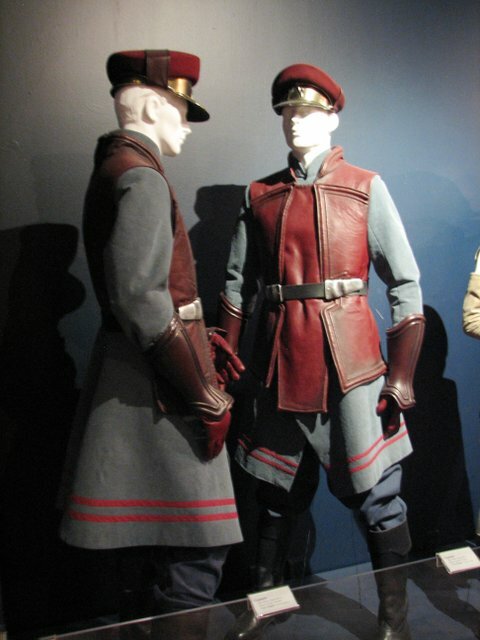 Mid-thigh length wool or wool-like sky blue coat with a stiff collar and a flaired bottom that forms an inverted V in the front with 2 red stripes along bottom of coat. Dark sky blue pants. Pants should be darker than the coat. Burgundy leather or leather like jerkin with edging. Jerkin is longer in the front and stops at the waist in the back. 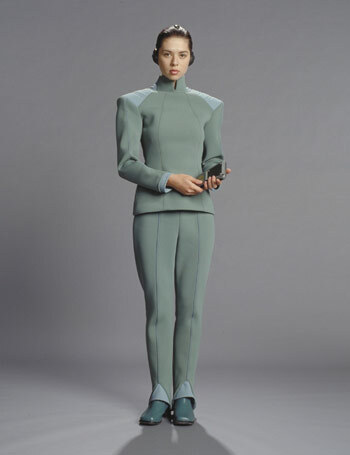 Mid-thigh length wool or wool-like sky blue coat with a stiff collar and a flaired bottom that forms an inverted V in the front. Coat can have 0, 1 or 2 red stripes but no more than 2 along the bottom. 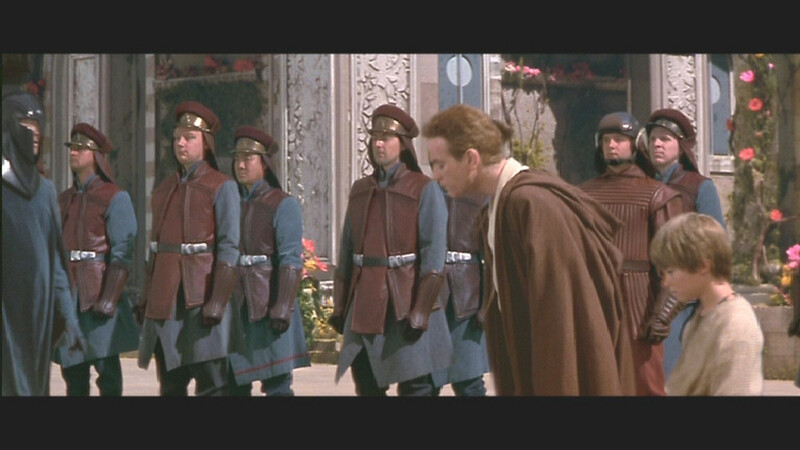 Assembled Naboo Security Officers with different ranks. Blue-grey jumpsuit (or pants and longsleeve shirt) without pockets. Light blue waist-length stiff tabard rounded on the bottom front and back. Wide border that matches pants/jumpsuit. Silvery comm bracer on one forearm. A blaster and holster, unless local laws prohibit or strongly discourage carrying anything that looks like a firearm. Sleeves and legs have a light blue stripe along the outside. Blue-grey waist length stiff tabard rounded on the bottom front and back. Shoulders extend to or just past the trooper's shoulders. Light blue border that matches pants/sleeve stripes & is about 1-2" inside edge. A blaster, unless local laws prohibit or strongly discourage carrying anything that looks like a firearm.